There are few home improvement projects that you can undertake that will add as much value to both your property and your life as adding a detached garage. Garages are not only an attractive addition to your home when it comes time to sell, but they can provide you with additional living and storage space that you’ll utilize on a continuous basis. 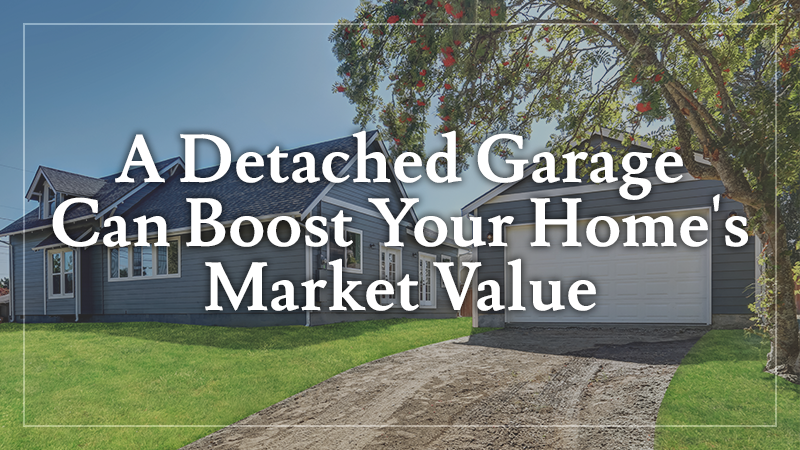 A detached garage is a much less expensive and intrusive way to raise your home value by adding additional square feet to your overall living space. Whether you’re looking for extra storage space or a place to park your vehicle after your current garage has been taken over by your kids, a detached garage is a great way to get extra space without spending a fortune. If most of the homes in your neighborhood have garages and your home’s garage has been closed in for additional living space, creating a detached garage can bring your home back up to the standards that are around it. If your home has less to offer than others in the neighborhood, your overall home value will suffer when it’s time to sell. 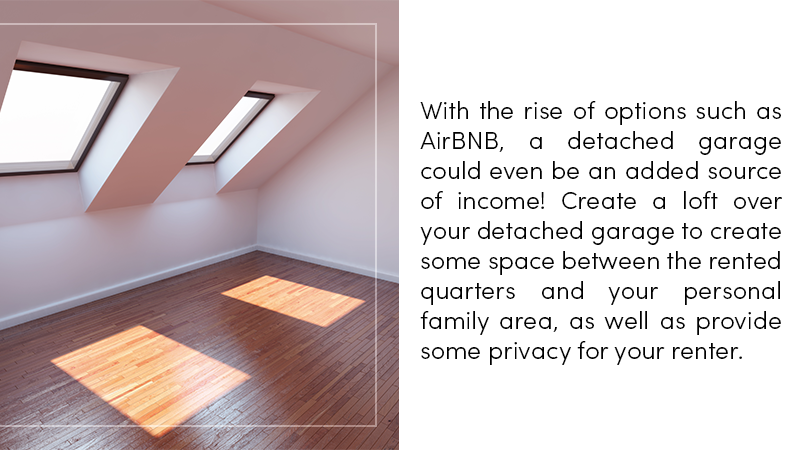 With the rise of options such as AirBNB, a detached garage could even be an added source of income! Create a loft over your detached garage to create some space between the rented quarters and your personal family area, as well as provide some privacy for your renter. Separate entrances keep things even more segregated and clean. If you’re tired of crawling into the attic each time the season changes to retrieve decorations, home decor items and boxes and boxes of clothing, then a detached garage may offer a viable alternative. Keeping your storage a little closer to the ground is often appreciated, and a garage gives you the clean, pest-free environment that you need to ensure that your valuables are maintained in the best possible way when you don’t need them. One of the huge benefits of a detached garage is that they don’t necessarily have to take away from the beauty of your home. They can be positioned in such a way that they’re not visible from the street, or at an angle to your home so they don’t ruin the lines of your home. Since they’re not taking up valuable real estate, you could instead fill that space with a small garden or deck attached directly to one of your home’s back or side doors. When you’re ready to explore whether or not a detached garage is right for your home, contact the trusted professionals at L&L Contractors. We’ll work with you to ensure that you’re getting exactly the right options for your personal needs. Our excellent customer service and guaranteed warranties make us Middle Tennessee’s #1 source for quality siding, roofing and more. Contact us today to schedule your free initial consultation.